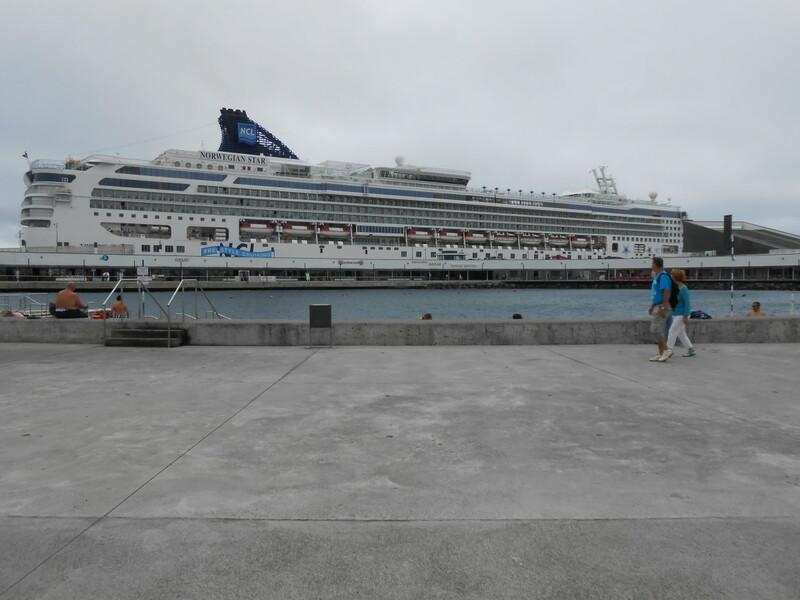 The Sapphire Princess cruise ship is not the largest of the Princess fleet. But with a passenger capacity of 2670, it certainly can accommodate a large number of cruisers. The ship, built in 2004, has a length of 952 feet and boasts 740 balcony rooms. 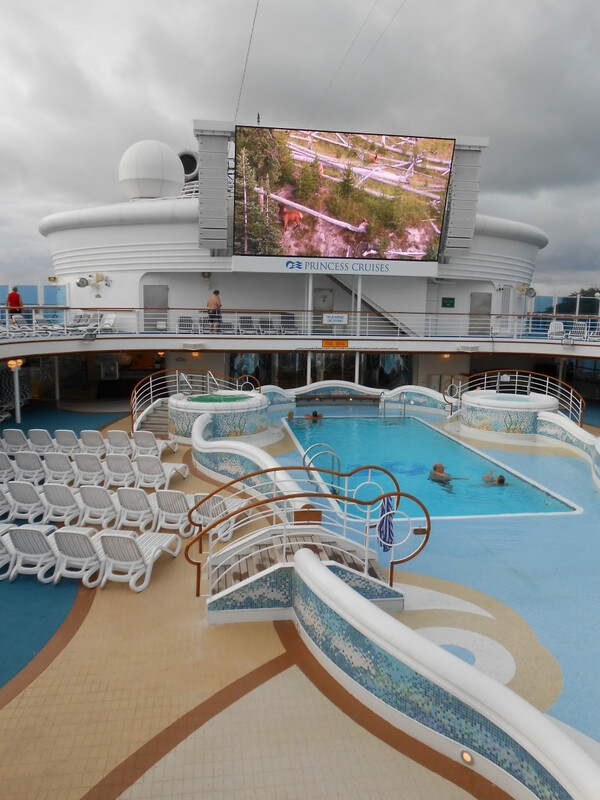 Updated in January 2012, it now boasts the same features Princess passengers have come to love, such as a Movies Under the Stars Screen and flat-screen TVs. I recently cruised on the Sapphire Princess on a 28-day cruise to the Hawaiian Islands, The Samoan Islands, and French Polynesia. 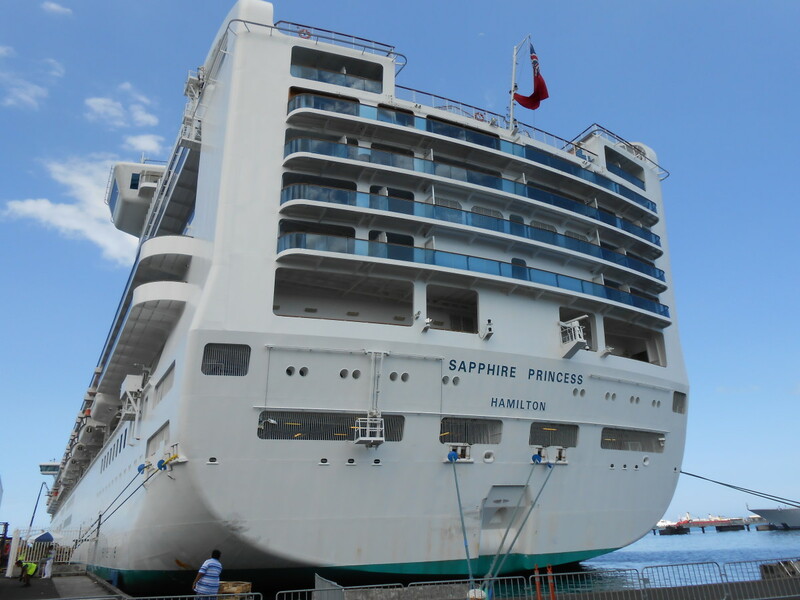 I was so pleasantly surprised by many facets of the Sapphire Princess that I could not keep the information about this wonderful ship to myself. The following is a review of my experience on the Sapphire Princess. 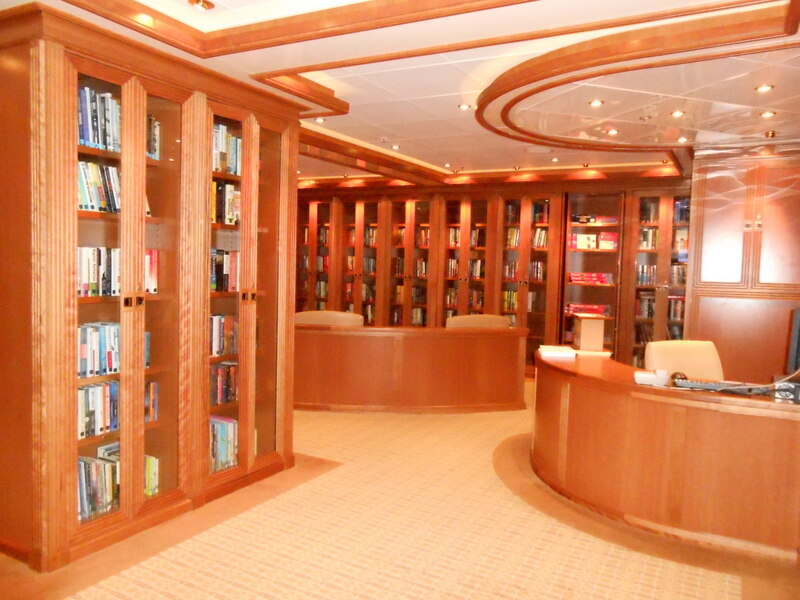 Accommodations: There is a great variety of rooms to choose from on this ship. 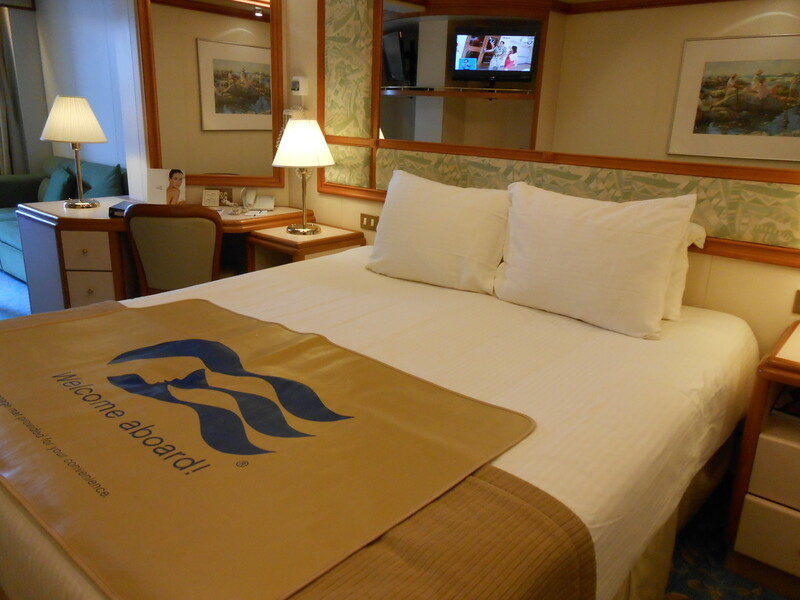 While on the Sapphire Princess we had a mini suite. It was just perfect for two people for a one month trip. The bed was very comfortable. The room has two TVs, one of which faces the bedroom and the other that faces the couch. This is perfect for couples who may not want to watch the same TV show. Or for when I wanted to take a nap, and my husband wanted to watch TV. There is also a desk area that can be used as a makeup table before going out. 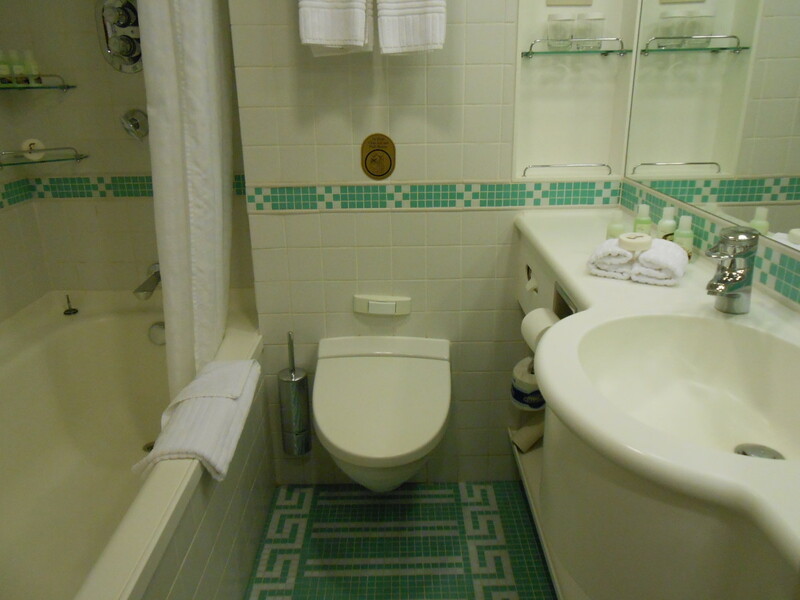 The bathroom was plenty large enough, unlike some cruise ship bathrooms, there was plenty of room to move around. The mini suite has a large balcony with two chairs, a small table, and two stools to use to relax and put your feet up. Built in 2004, and although has been recently updated in many of the public areas, the ship still shows some wear and tear in the passenger rooms. If one can overlook a dented wooden railing near the television, or a missing chip from a bathroom floor, you will be fine with the accommodations. One of the best things about the Princess Cruise line is that you are given the option of having the staff do your laundry, or do it yourself. We were fortunate that our room was two doors down from the laundromat area. We could access it quickly and at times that were convenient for us. 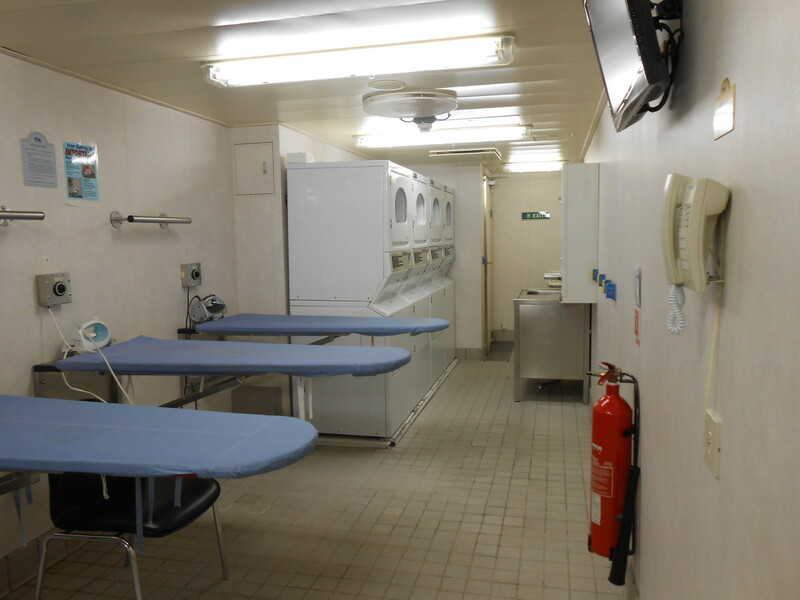 There are two laundry rooms on the ship. They both have four ironing boards and a row of washers and dryers. They also have machines with small packets of laundry soap and dryer sheets. Entertainment on the Princess Sapphire was varied and interesting. There were shows by the Sapphire Princess singers and dancers in beautiful costumes. There were a few comedians. We had seen one, whose name was Sarge, back a few years ago when we were on another Princess ship. Unfortunately, he did the almost same exact show, with the same jokes. That was quite disappointing because he wasn't all that good the first time. Princess does do a great job of having entertainers hop on and hop off the hip at various points too though. We were treated to a wonderful piano concert by a young woman from Australia who was only on board a few days. It was one of the highlights of the trip though. During the afternoon and evenings, there are musicians that give concerts in the gorgeous three-story atrium. 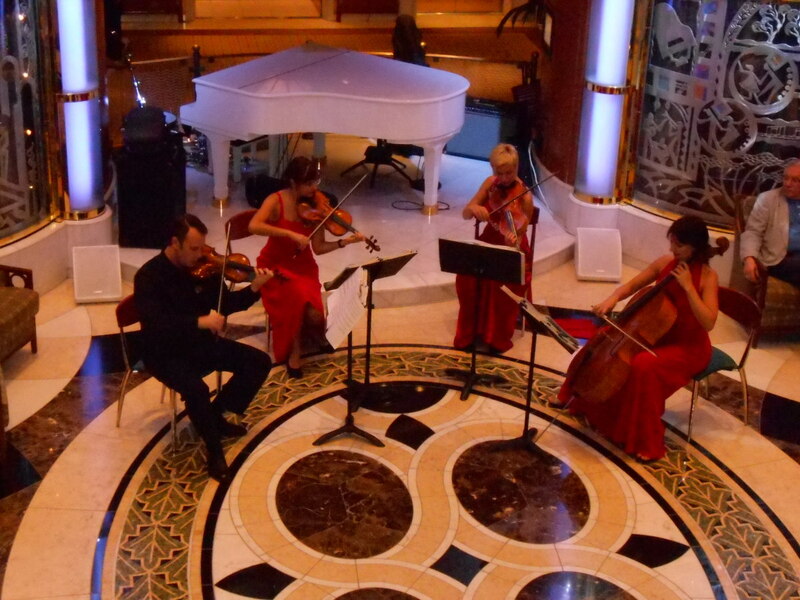 One such set of musicians were a quartet with strings, and they played beautifully together. At other times a pianist plays. At night from approximately 8:00 p.m. till 11:00 p.m., there are a variety of musical choices from a piano bar with sing-a-longs to a band that you can dance to. In spite of the repetitious comic, I would say that the entertainment on the Sapphire Princess is quite good as a whole. At first glance, the library looks small. But it does have enough books to keep one interested and coming back. There is also an area for guests to share their reading material. Magazines and some books were placed there by other passengers to be shared. One must be careful not to share anything they don't want to be returned though because someone left a book to be shared and did not get it back by the end of the trip. The library also has a daily Sukudo puzzle and board games to be used. The library has recently been refurbished, and the wooden cabinets positively gleam. 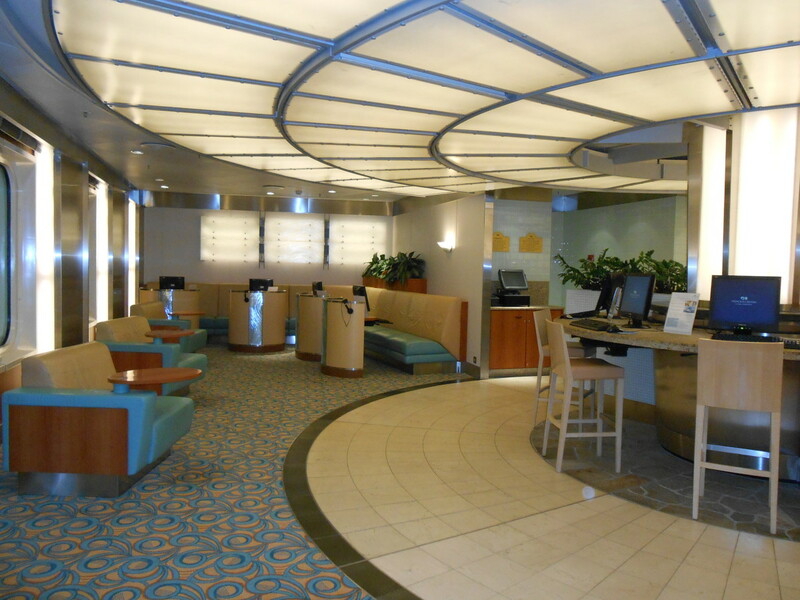 At one end of the library, the future cruise information desk can be found so it's a wonderful place to sit down in and peruse all the pamphlets on future Princess cruises. 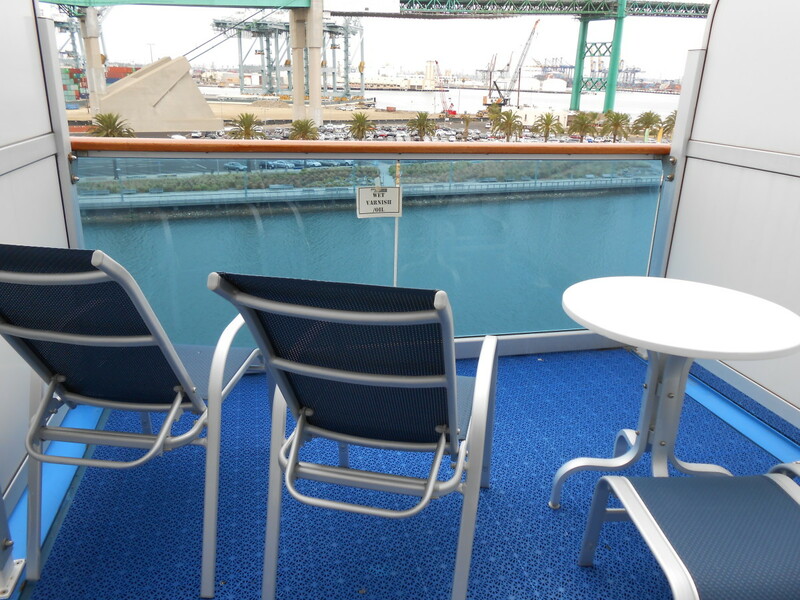 The Sapphire Princess has plenty of recreation areas. From the five pools to the workout center, there are a lot of opportunities to get exercise. Two of the pools are the same size and are available mid-ship. One of these pools has a glass roof, with a solarium for quiet reading on the second floor. This pool is used more often in the case of inclement weather. There are two hot tubs at the end of this pool. My favorite pool was outside of the workout area and is attached to the spa. For adult use only, one does not have to pay extra for this pool. It is also is surrounded by two hot tubs. There are more than enough treadmills as they start in one room and go into another fitness room. They are lined up all across the front windows so one can be walking on a treadmill and seeing exactly where the ship is headed. The treadmills also all have TVs attached to them, so it is easy to make the time go by as you do a workout. There are recumbent bikes, weight machines, and classes in aerobics and yoga as well. If a passenger is interested in other forms of dance, there are Zumba classes that are free every day the ship is at sea. There are also periodic line dancing classes and ballroom dance classes. There is a center court area for basketball, a jogging track, shuffleboard, and a for-fee golf simulator for putting practice, and a nine-hole putting area. On board, there is also a life-sized chess board with large chess characters. 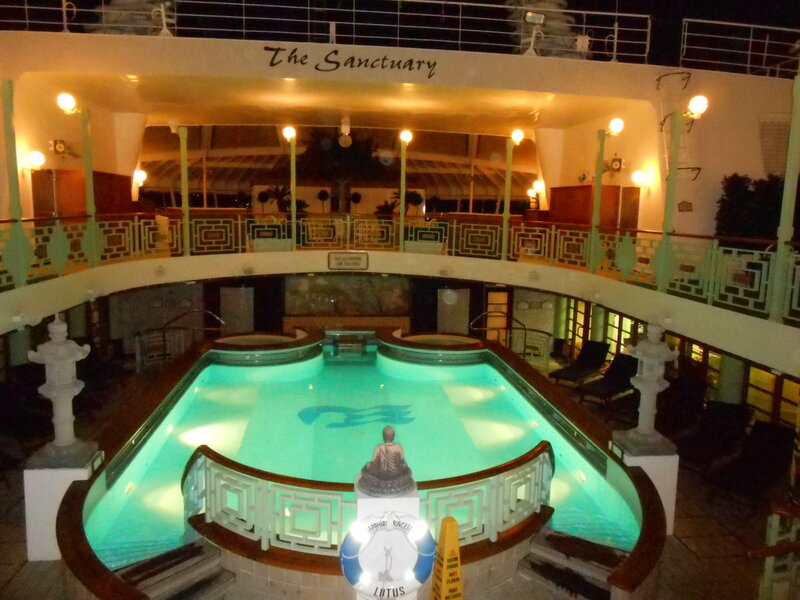 If being quiet and enjoying a mind challenging recreation such as puzzles, there is a puzzle table where guests can work on puzzles alone or in small groups in the solarium above one of the pools mid-ship. The service on the Sapphire Princess was very good. Our friendly room steward always left chocolates on our pillows each night. Princess does not leave the cute little towel animals that you may find on some other cruise lines but the chocolates on the pillow each night are a delicious touch. Staff in the dining rooms and other areas of the ship were always pleasant and offered to help whenever possible, including offering to carry food trays and finding seats in the Horizon Court. The food on the Sapphire Princess was quite good, and we have no complaints. The Horizon Court offers an array of delicious foods. Most of the food was available for passengers to serve themselves which cut down on long lines. There was plenty of staff who readily replaced foods when they were running low. The dessert area had its own dessert chef who handed out desserts from a glass case. Passengers picked what they wanted, and he handed them their choice. I am sure this is to cut down on the amounts of wasted desserts. I found out that there is only one dessert chef for this area. He makes all the desserts personally and then has help decorating them only. The cheesecakes in the Horizon Court were varied and absolutely delicious. I couldn't wait to try each different kind. One of the highlights of the Horizon Court was the cookies. Available in peanut butter, chocolate chocolate chip, and oatmeal raisin, the peanut butter was out of this world and so popular that they often ran out before the Horizon Court ended its meal service. There are four main dining rooms on the Sapphire Princess, each with its own theme. The Santa Fe has a southwestern décor, the Vivaldi a more opulent feel, the Pacific Moon has a decidedly Asian flair, and the Savoy has a sophisticated look. Each has the same menu with one exception that gives a wave at the décor, such as an Asian specialty dish in the Pacific Moon. Traditional dining with seating at 6:30 or 8:30 is available, as well as anytime dining. We choose anytime dining at a table for two. We usually arrived between 7:30 p.m. and 8:00 p.m. and never had to wait for a table. There are two specialty dining rooms, Sterling Steak House, serving steak and one Italian restaurant, Sabatini's with an extra charge to eat there. Because the food in the other restaurants was so good, we chose not to pay extra money to dine in these restaurants. Each day at 3:30 there is an afternoon tea served in one of the dining rooms. Coffee is available as well as tea, and small sandwiches and delicious sweet treats are served. 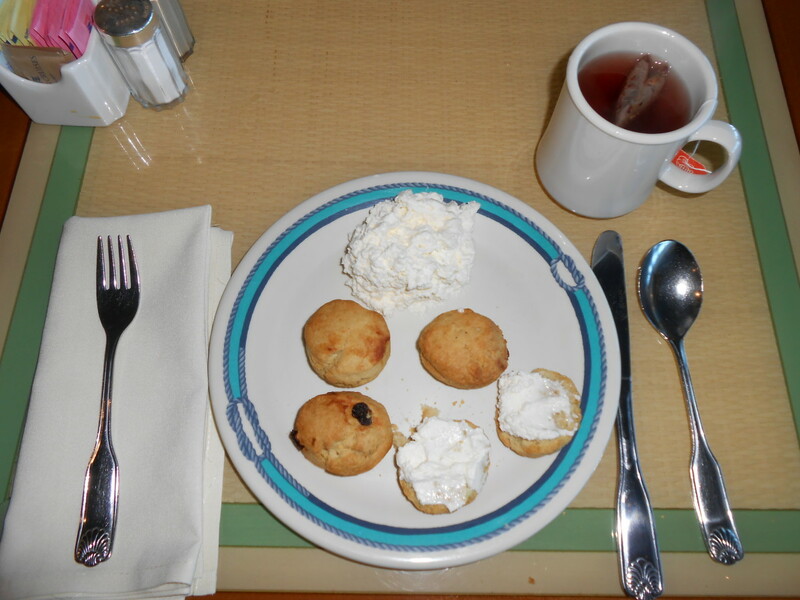 My favorite treat was the scones with fresh whipped cream, which is also available in the Horizon Food Court at the same time each afternoon. Soft serve ice cream is available every day out near the pool area. Also near the pools is a grill where hamburgers, hot dogs and grilled chicken sandwiches and fries are available with all the fixings. On the other side of the pool, passengers can have pizza all day long and until 11:00 p.m.
By the atrium area, the International Cafe offers breakfast pastries in the morning, and soups sandwiches and salads all day long and into the evening hours. Eating these delicious treats while listening to the classical music in the nearby atrium is a wonderful experience. 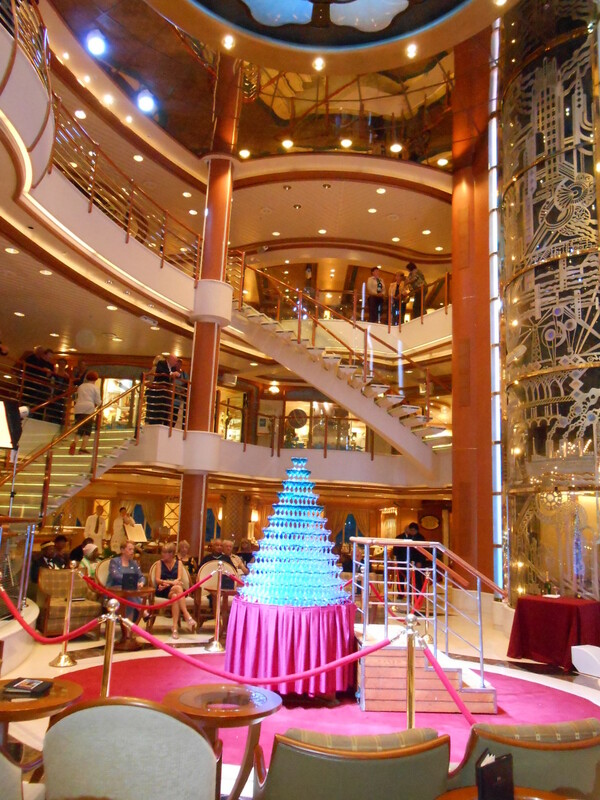 The Sapphire Princess provides a fantastic cruise experience. The cruise we went on was a long one, and there were very few children aboard. But there is a children's program and two children's areas available. The food was great, and the service was wonderful along with the accommodations. If passengers can look past the areas of the ship that are a bit on the worn side, the Sapphire Princess will provide a wonderful cruise experience for those who choose to cruise aboard this ship. Have You Cruised with Princess Cruises Before? Yes, and I enjoyed this cruise line. Yes, but I didn't like this cruise line. No, I haven't but I hope to someday. Thanks Eurofile. 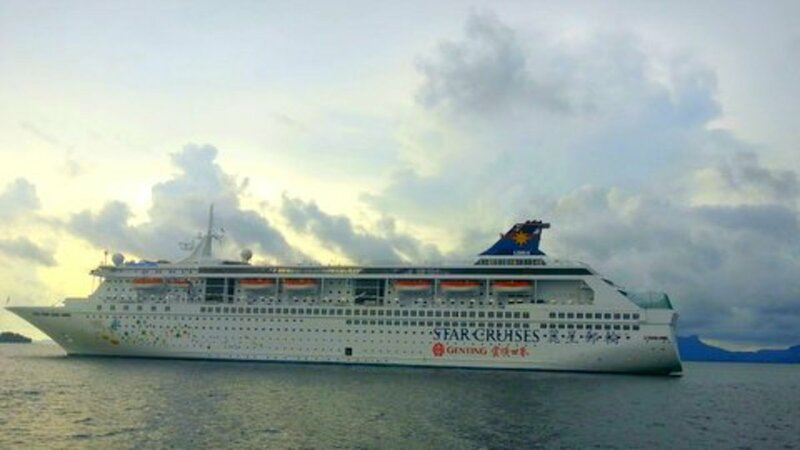 I love to cruise and have written a few articles about different ships/cruises I have been on. Thanks for the comment. This is a really helpful account for anyone considering cruising. Great photos too. Thanks. I got my camera specifically to take pictures for HubPages. I love to use it to illustrate my writing here on this site. Thanks for your comment. 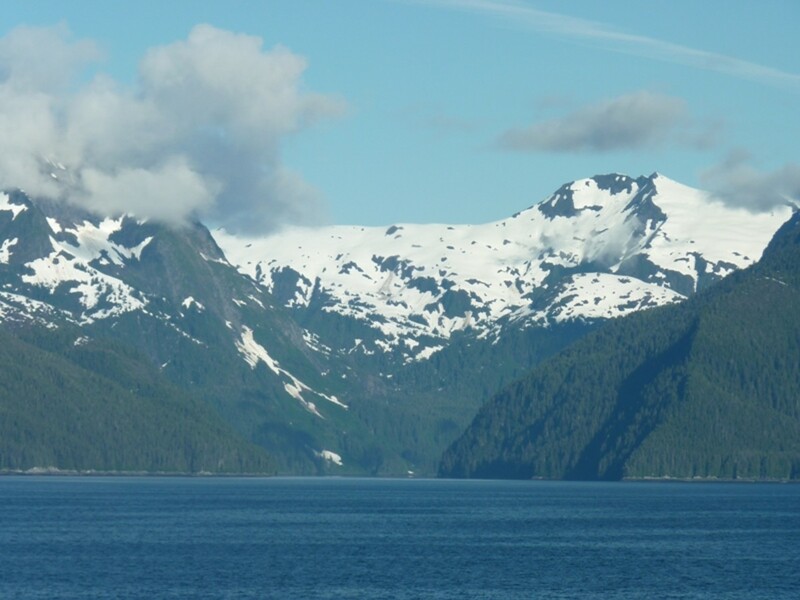 Awe-inspiring images from your cruise ship cabins trip. They really capture a sense of the fun and expansiveness of the boat. Voted-up! Our cruise was nice but your looks much better! Well, there probably are some singles cruises out there but since I am married, I have never looked into it. I know the Princess cruise I was just on had a couple of meetings for single cruisers so people traveling alone could meet each other. I also know that the Norwegian Epic has a section of rooms just for single travelers with a lounge area in the middle of these rooms so other single travelers could hang out together. Good luck. Thanks for stopping by and for leaving a comment. Hello fellow hubber, I have never rode a crusie because I felt that they were not as adventurous as I would like. However, I am having second thoughts. I want to check out the shows, recreational activities and people. I was hoping to find a single's cruise where I could meet some women, ha ha, but really the cruises seem like they would be interesting depending on where they go. Well, there are still some small ships out there. depends on where you would like to cruise to. I went on my first cruise with my husband in 2006, and fell instantly in love with cruising. We try to go on one each year now. I am hooked! Thanks for dropping by! I am glad you enjoyed the photos. must say they came out very well. I love my camera and whenever my husband and I travel, I use it to the max! Thanks for reading and commenting. A very good informative hub. Thank-you for all the great info...I enjoyed the photos...well done....voted up! Thank you for this great review. It has been years since I cruised. The ships were much smaller then. I hope you don't mind if I call you that! I think it's cute and it beats typing that long name every time I respond to one of your wonderful comments. The price does include the food in most restaurants ( there's a few that you do pay extra for if you choose to eat in them. We don't...why pay when you can eat in about 10 - 12 other places for free?) And it includes water, iced tea, lemonade ( on some cruise lines) and orange juice in the morning. Alcohol and soda are extra. ( Some cruise lines will let you bring wine on, Princess included. But you can only drink it in your stateroom, not in the public areas) It also does include the entertainment. Isn't that fantastic? I think a cruise is the best vacation going!!! Ha ha...yes I did say way up North. I hear it even snows there. I don't want to leave new England but my husband does and he has family in Georgia, so I said the only way I would go is if he gets me mountains. That's why we are looking there. It doesn't get as cold there as it does in CT though so he's ok with that. Hello Karen, Did you say Big Canoe all the way up there in the North Georgia mountains? Nooo, that's too cold for me!!! It's a good 3 hours from my neck of the wood, and about an hour North of Atlanta. I'm further south, towards Florida. First of all, I want to say that I've always appreciated and admired your writing style. Oh, but these pictures that you took! Superb, and worthy of a cruise liner brochure! You definitely had my vision turned ASEA. I gotta take my wife on one of these someday. So, let me ask you one simple question...the food, the snacks, the drinks...are they all included in the pre-paid amount, or are they extra charges? Same with the entertainment? Is everything included? If so, DOUBLE WOW! What cruise lines have you been on? Have you written any hubs about them? I would love to read them. The 28 day cruise was fantastic. Lots of material for hubs! Aren't cruises the greatest? I love them. I get a few hubs out of each of the cruises we take. 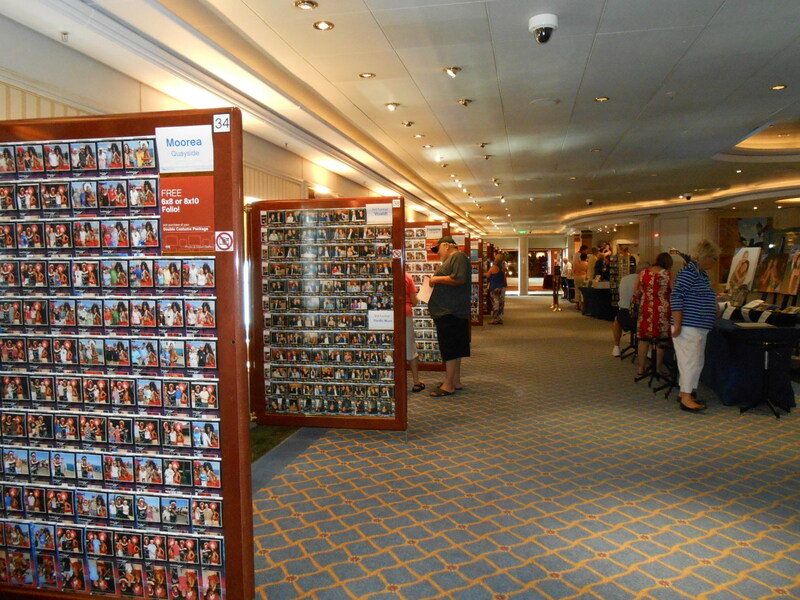 I still have pictures from that cruise that I need to use in hubs...so many hubs to write, so little time! By the way, I see you are from Bonaire, GA. We are looking at possibly moving to Big Canoe in the North Georgia mountains. Do you live anywhere near there? Love your pictures of the Princess Cruise! I too went on a 7-day cruise on the Carnival Magic. Got lots of pictures of the islands we visited, but not much was taken onboard. It was a very relaxing time for us. Did a lot of sleeping in, eating, and sightseeing. Wrote two hubs about it, and I think I can still get one more out of it. Great hub. Voted up and beautiful. Good hub. I have been on many cruises over the years but I have never took a cruise on ships from the Princess Cruise Line. However, after reading your review I would consider checking out this cruise line for a future cruise. Also, I never booked a cruise for a month that must have been quite an unforgettable experience for you. Voted up and interesting. Thanks for the review of your cruise. Thanks for commenting. After you go on your cruise to Hawaii, make sure to write a hub about it. Between the experience and the hub, with added pictures, it's like experiencing the trip all over again! super job and I am extremely envious and would love to pop on board. You covered everything perfectly. sounds like you had a wonderful time We have been talking about a cruise to Hawaii and this really helped a lot. The suite you had looked great and room to spread out. And the entertainment superb. I know you were out to sea a lot but seemed to have plenty to do. Thanks for a great write..Voting up and pinning.